The Center for Responsible Lending offers that most people seeking debt settlement would need a minimum of four accounts to find any benefit from the process. Moreover, working with a debt settlement doesn’t offer any guarantees. Not all lenders work with debt settlement companies, so it’s possible that there could be no benefit at all. 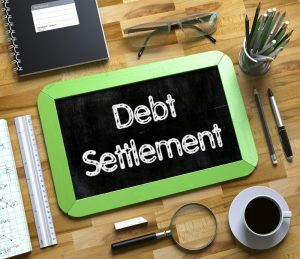 Debt settlement firms also charge a fee in most cases — so if you settle an account worth ten thousand dollars for six thousand and the firm charges 25%, you’ll still owe a net of eight thousand dollars. You also may owe taxes on your forgiven debt. Debt settlement also won’t do anything to stop collections agents from waging their harassing phone campaigns. With Chapter 7, you may also hear this called liquidation or straight bankruptcy. The process takes about six months and requires a substantial fee which could be well over $1000. This process also requires that you work with a credit counseling agency. With Chapter 7, you may clear secured debts by giving up your nonexempt property—property exemptions vary by state. You must prove you don’t have sufficient income or resources to pay your debts to qualify for Chapter 7, and it is likely that you will not keep your assets (car, tools etc. ), as they will likely be sold, with the proceeds used to pay creditors. If you have too much income to qualify for Chapter 7, you may apply for Chapter 13. In this model, you may be able to restructure your payments and negotiate some debt cancellation, but there are similar requirements and restrictions just as with Chapter 7. If you’re currently struggling to make payments and have begun to fall behind, bankruptcy is not your only option. You may be getting stressful calls from creditors or threatening letters. Nonprofit debt management and debt consolidation are different ways of getting your finances back on track without declaring bankruptcy. Programs like this apply to unsecured debt such as credit cards, loans or medical bills. Secured debt such as auto loans and mortgages aren’t covered in non profit debt consolidation, but often, it’s possible to save enough on credit card bills that mortgages or auto loans can be affordable again, which can help you avoid bankruptcy. If you’re considering bankruptcy, call CreditGUARD today at 1-800-500-6489 to get a second opinion on your current situation. Our certified credit counselors can help you assess the situation and take the first steps toward a better financial tomorrow.